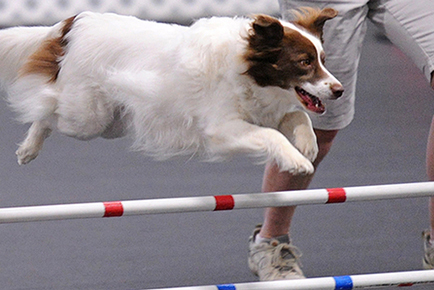 Jane B. and Chuck P.
Agility 101 will continue to meet through the Summer Months! Check for availability of spots! Last Summer Session will be 5 weeks prorated for amount will be $87.00 for the 5 weeks. Agility 101 will cover the agility foundation skills essential to successfully navigating an agility course. This class is for beginner dogs and will focus on teaching both dog and handler safe and enthusiastic performance of all obstacles including jumps, contacts and weaves. In addition, we will teach teams how to work together in unison and perfect handling skills such as the front cross and rear cross etc. Teams will start with the basics of flat work, targeting, shaping and come to side. Our focus is to build teamwork and enjoyment thru games and fun drills as the dogs mature and grow. To be eligible for this class dogs will be assessed on the first class for ability to sit, down and come on command under mild distractions. We will be looking for a working relationship between dog and handler and a willingness of handlers to learn and train. We want dogs to want to stay with their handler and engage with the handler even with other dogs moving around them. It is our hope that dogs will stay in class through at least three (3) or four (4) six-week sessions with the goal of the dog/handler team achieving competence in handling and running an agility course. While we would hope that our students go on to compete, our main goal is for both the dog and handler to find a fun activity and build a lifelong bond. Dogs must be nine (9) months old or older, or have instructor permission. Note: Dogs who show aggression to humans or other dogs are not appropriate for this type of setting.